Try running memtest86 on each of your ram sticks, one stick at a time, up to 8 passes. Only error count you want is 0, any higher could be cause of the BSOD. Remove/replace ram sticks with errors. seems odd they all have the same crash address. MIght not mean anything though. its not ntoskrnl, it just gets the blame. could run Asrock App store (its on download page of website) and see if any new drivers - there are newer lan drivers for instance. The INTERRUPT_EXCEPTION_NOT_HANDLED bug check has a value of 0x0000003D. see what memtest shows, until we know ram works, random errors like this could just be caused by ram. what ram do you have? is it on motherboard compatibility list? if your motherboard has it. try enabling hpet (high precision events timer). set it to 64 if theres an option for it, if not enabled is good enough. win 7 and win10 users need it enabled for windows to time its functions correctly. if its off windows will randomly crash with errors like above. this program is Asrocks version of a driver updater BUT it matches hardware, and is far safer to use than Driver easy. Just curious, why powershell instead of CMD? Personal preference or is there something better about it? Should I execute all things in powershell over CMD? Went to download page, got the all-in-1. I ran it but it said I have ver 18.10 currently installed and 17.12 is the local driver. So its outdated. Enable this? If you say so. But why wouldn't mobos come with this enabled by default if its known to cause literal random crashing? because windows 8 doesnt use it. and will cause it to constantly bsod if enabled in that o.s. Did chkdsk on C: drive. Went to away shower watching it at 6% done, and came back to a blue screen. When I restarted my PC it claimed windows failed to load. Restart, crash again while logging in. Restart, crash again, Restart, crash again, again says windows failed to start and offers advanced options. Dump files are binary (meaning not text) which means they can't be opened and read with standard Notepad like applications. ryzen+ doesnt like ram with odd timings so if you use odd numbers for your ram you must disable gear down mode. and may need to run at t2 command rate ???. also if the ram is single rank dims disable bankgroupswap. these 2 allowed me to run my ram at stock xmp t1 mode. it took a minute and it restarted a couple of times till it learned the timings for the rest of the ram. windows boots and i load up hwinfo64 https://www.hwinfo.com/download/ and in the bottom right of the system summery. the ram timings the system chose are displayed. copy them down and put them into the relevant positions in the bios ram settings including command rate to t1. save and boot. So Ryzen decided just recently that it doesn't like odd timings, and for the past year it has been tolerating it? Why is this just now a problem.....? xmp is extended memory profile. 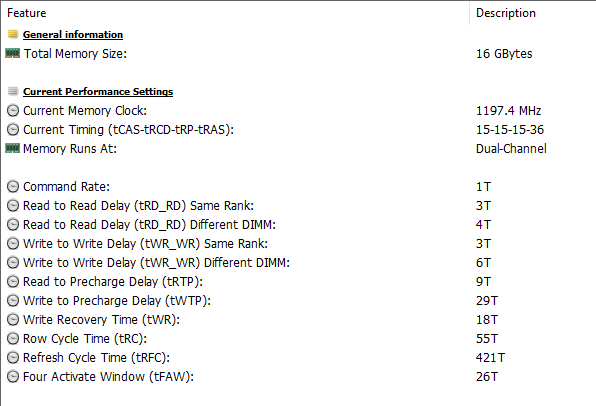 basically its a manufacturer overclock on the memory. its perfectly safe to use and needs to be enabled to select the correct timings for the faster speeds. 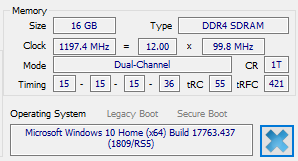 cl15 is the default for the ram but if you load up hwinfo you will see its not actually running at 15 but likely has been rounded up to 16 due to geardown mode being enabled. and no its not a recent thing, ryzen has been finikey with ram from the off. ryzen+ is less sensitive to ram than ryzen, but its still a bit schizo with some ram kits. especially 1s that are dual rank. dual rank ram allows bankgroup switching between the ram on 1 side of the pcb and the other. as single rank only has ram chips on 1 side of the pcb this (bankgroupswitch) wont work and may throw an error or even reduce your rams overall performance. you can check with your ram manufacturer to see if your rank is single or dual rank. This apparently does not say "15"
Me and my friendo own the same exact model RAM, and he's opened up his before (like an IMBECILE) and saw chips on both sides. I know it cant be a recent thing, its hardware.. But I've only lately been getting all of those BSODs. For the first year using this machine it was completely fine. I don't see why a hardware problem like this didn't start as soon as I put it together and persisted, like it should. looking at you hwinfo it looks like geardown was set to disabled by default. allowing the odd number on the cas latency and the t1 timing. if not then it may be an agesa update thats allowing it (assuming you updated your bios). what ever the reason your ram is running at cas 15 in that pic. it could be that you have been running the ram out of spec all this time and as a result may have caused some stability issue over time. hopefully enabling xmp/disabling geardownmode will sort that for you and give you back your system. I've recently-ish updated my BIOS to the absolutely latest version through the required steps, IE updating to this ver, then this ver through flash, then finally the latest ver. So you think "geardown" is disabled by default now that I've updated my BIOS and I should re-enable it? Could you go into detail about those steps? nah if your ram is set to an odd value its best left disabled. the settings for it are in the amd cbs menu on my wifi 5 sorry i have no idea about your bios. as its chip dependent on whether is shows up in bios. HPET would only cause issues if the timer itself or the software using the timer were buggy. Pretty sure the HPET on Ryzen platforms is perfectly fine, however, it's generally not used for most timing purposes anyway because of it's being a system call and high overhead associated with that. Ideally, HPET will be on in UEFI / BIOS (I'll just refer to this as BIOS) when Windows is installed, and Windows will determine at that time whether or not it will use it for timing functions. If the HPET is not present at Windows install because it's disabled in BIOS, it is also not enabled in Windows, and turning it on in BIOS after Windows is installed does not enable it for Windows timing functions, although other software that may specifically address it may still be able to use it. If you want to check the status of HPET usage in Windows, open an Elevated Command Prompt and type bcdedit /enum. If you see useplatformclock yes then HPET is enabled and in use by Windows timing functions. If you don't see useplatformclock at all, then it's up to specific software to address the HPET if it's designed to. To enable HPET in Windows (not recommended), at an Elevated Command Prompt type bcdedit /set useplatformclock true. To set the default value for Windows again, at an Elevated Command Prompt type bcdedit /deletevalue useplatformclock. I ran a few of the memory dumps through a debugger as well and concur with gardenman. It looks like memory corruption, but there could be some odd driver issues that are causing it and not necessarily hardware. Have you updated any drivers recently? I've seen cases where a SATA controller could not properly handle requests after a hard drive was put into sleep mode and would throw a BSOD when trying to address them. I would certainly disable hard drive sleep during your troubleshooting. I would also stop using any of the effected processes where possible, such as "unturned.exe" and see if the issue persists without those processes trying to access memory.